In business since 1990, MidAmerica Basement Systems is an experienced basement waterproofing company with the skills and tools needed to provide lasting solutions to your basement moisture or flooding needs. We've proudly earned the Business of Integrity Award from the Better Business Bureau of the Quad Cities by serving our customers with honesty, commitment, and accountability. In addition to providing exceptional service, we install patented proven waterproofing solutions that are custom designed to fit in your home. We are the exclusive installer of Basement Systems products in Quad Cities and Peoria. If you've noticed water or dampness in your basement, call in the experts at MidAmerica Basement Systems! We offer free estimates for all of our services - schedule yours today! 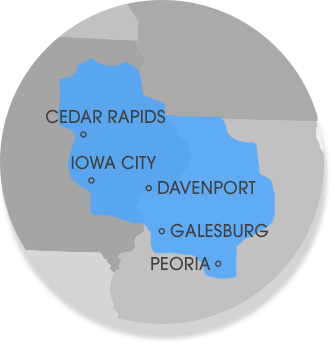 MidAmerica Basement Systems fixes leaky basements in Illinois and Iowa, in areas like Dubuque, Iowa City, Normal, Clinton, Moline, East Peoria, Rock Island and neighboring towns and cities. Contact us today for a free wet basement repair estimate.